He’s skilled. He’s talented. He’s dominant. And he’s gigantic. When he’s on his A-game, he’s a giant amongst men. He’s the reigning league MVP and his stats and play on the court solidifies his place as arguably the best player in the PBA right now. For his team, the San Miguel Beermen, he is their MVP as well. I mean, he literally is the most valuable player on that roster. Yes, they have a couple of ex-Smart Gilas players and they have a former MVP, but without JMF’s dominant presence on the floor, their team struggles and will lose eventually come playoff time. And yet, the Kraken needs help. Fajardo knows that he cannot win a championship all by his lonesome. Not in this league. He will face systematic defenses – schemes that are designed to pack the paint with multiple players. He will face guys his size – this is where the likes of Greg Slaughter come into play. The point is, all eleven other teams have schemes made solely to stop Fajardo. And last night’s game against Alaska proves that teams are more than willing to take on the Kraken. The Aces used different players and different styles of defense to keep up with the MVP. They sent Sonny Thoss, Calvin Abueva, and Vic Manuel to defend Fajardo while their guards were ready to help and then rotate if he opted to kick the ball out. They went with a zone for a few times to focus on the paint, and when they switched to man-to-man, they either fronted Fajardo or doubled him immediately. The Aces were extremely prepared, like a student who studied for an exam three weeks before. Other contenders like Purefoods and Ginebra can take a page from how well the Aces defended Fajardo. This is when help is needed. But what do I mean by help? Is it just his teammates producing more? Isn’t it enough that you have Arwind Santos? Are SMB’s plays too focused on Fajardo? One thing that struck me for the first four games of the Beermen was their over-reliance on Fajardo’s rebounding and efficiency on the floor. The points may be distributed fairly evenly among the entire SMB team, but it’s the shooting efficiency and percentages that jump out. The only person consistent here is Fajardo. Even though it’s a given that Fajardo has a higher field goal percentage because he lives so close to the paint, it’s the lack of consistency from their outside shooting that can cause trouble for San Miguel in the future. Arwind can’t go 9-for-10 one game and go 5-for-15 in the next. And what about Lassiter? He has been struggling to say the least. Last night he only made two field goals out of 13 shots and was 0-for-7 from downtown. Talk about shooting blanks. It’s not really the number of shots that the San Miguel players take. In fact, the attempts are spread out pretty well. It’s the shot selection that’s eerie. Lutz, Lassiter, and Santos may be relying too much on Fajardo to grab the offensive board every single time they put a shot up. In all of their games, there were at least two or three instances when either Lutz or Lassiter settled for an off-balance fadeaway and June Mar just cleaned the mess up by putting it back in the hole. The perimeter players got away from shooting inconsistently in the first three games, but the law of averages finally caught up with them against Alaska. 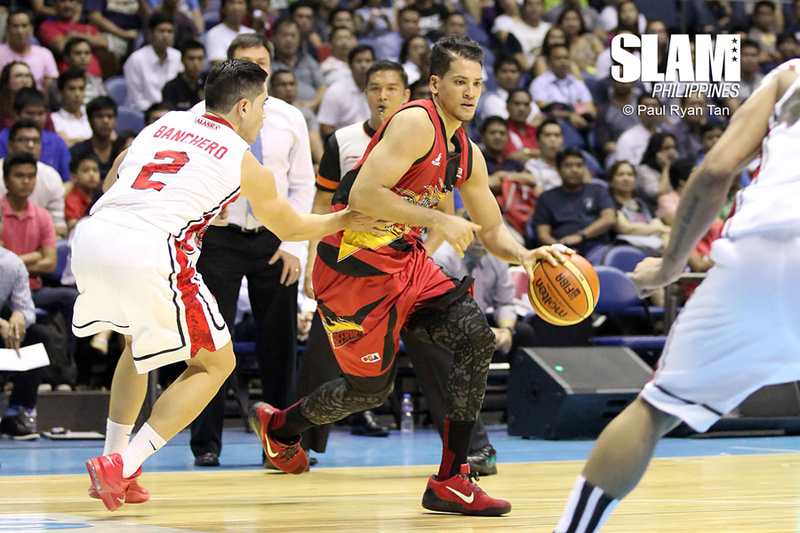 Fajardo got 16 rebounds, nine of which were offensive, but he needed to grab more in order for them to get the win. It doesn’t help also that off the bench, SMB fielded either Justin Chua and David Semerad and not Doug Kramer and Rico Maierhofer. 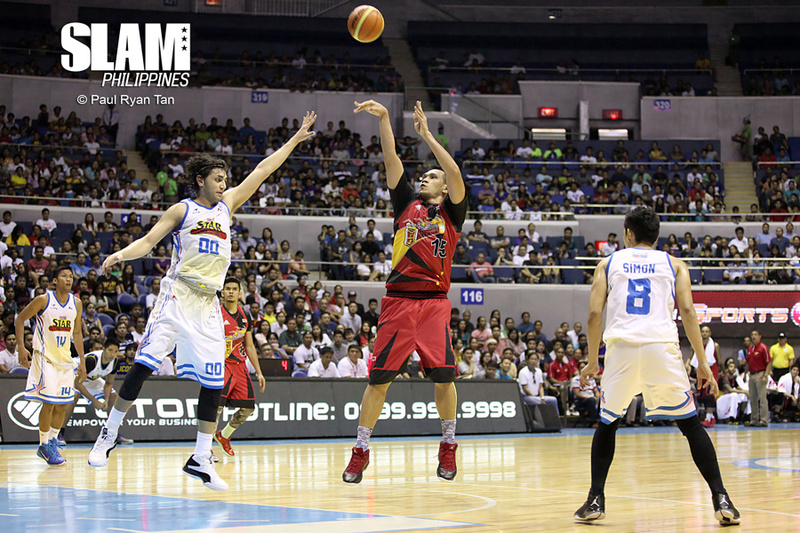 Both Chua and Semerad are still new to the PBA and to what SMB wants to do. In last night’s game, Semerad had four points (all on free throws) and five fouls in 11 minutes, while Chua registered 0 points in four minutes. The Kraken needs some big guy help. When Fajardo goes to the bench, SMB becomes a totally different team. And on some levels, that’s okay. Fajardo on the bench means Arwind Santos gets more room to operate. Their offense can actually survive without Fajardo on the floor. However, the problem is on the defensive end, plus the rebounding. Abueva and Thoss were in foul trouble and the SMB players didn’t do enough to exploit that. Abueva, at 6’3”, got 18 rebounds, seven of which were from the offensive glass. There has to be a balance between going with Fajardo, meaning feeding him the ball, and designing more plays for other players. And again, the perimeter players – Lutz, Lassiter, Mercado, and you can also include Chris Ross and Ronald Tubid – have to shoot as if Fajardo isn’t there to get the rebound. They have to act like snipers, shooting with precision and accuracy, and not be like Rambo, who uses entire magazines to shoot bad guys. It’s still early in the season, I know. And June Mar will still be June Mar. He will still be dominant versus whoever he’s up against. However, the San Miguel Beermen know that they have to utilize all of Fajardo’s capabilities, while still producing quality and efficient numbers as a team if they want to have success in the playoffs. SMB needs their MVP and the MVP also needs his team.